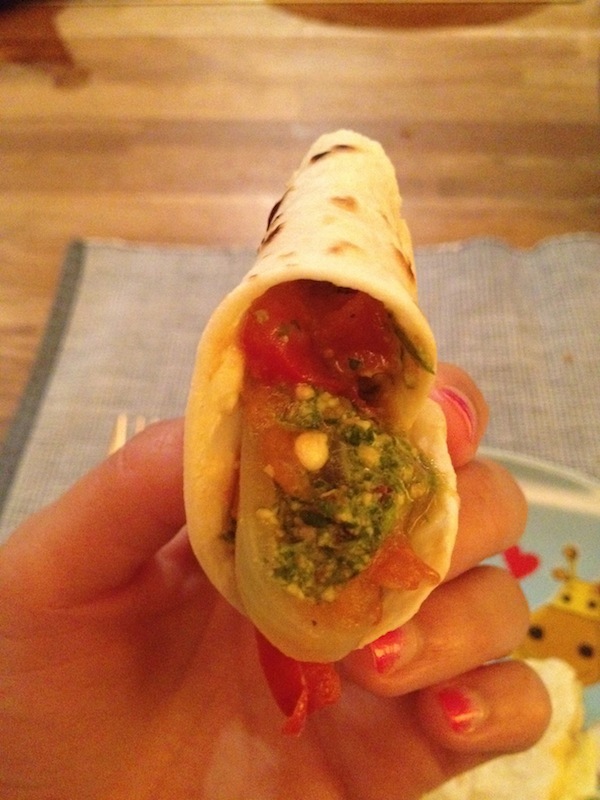 So I was watching a food show about Indian street food, which featured this very inspiring versatile chapati wrap. What makes it unique is the beaten egg cooked with a chapati on top. The result is a chapati with a velvety thin omelette stuck to one side. The chapati is then filled egg side in with a cooked thick tomato, onion and cut up chicken mixture and rolled. I asked an Indian friend about the wrap and she said that it was called a Johnny. She didn’t know why. First make chapatis. Mix 1 cup wholewheat flour with 1 cup plain flower. Stir in 1 teaspoon salt. Make a well and mix in 1/2 cup of water and 1 tablespoon oil. Mix and knead. If you feel it is dry, mix in more water 1 tablespoon at a time. Knead well and leave to rest. Cut the dough into 8 equal pieces. Roll them out as thinly as possible. Cook each chapati on a hot flat pan flipping frequently, every 6-10 seconds, until puffy. Wrap the stack of chapatis in foil while still warm. And if you’re not into bread making, simply buy ready made chapati. Saute half a large onion thinly sliced in olive oil until soft. Add in 2 chopped tomatoes and 1/2 a teaspoon ground cumin and cook until saucy. Add 1 large thinly sliced red pepper. Cook further for a few more minutes. You don’t want the peppers to soften too much. Season to taste. Turn off heat and leave aside. 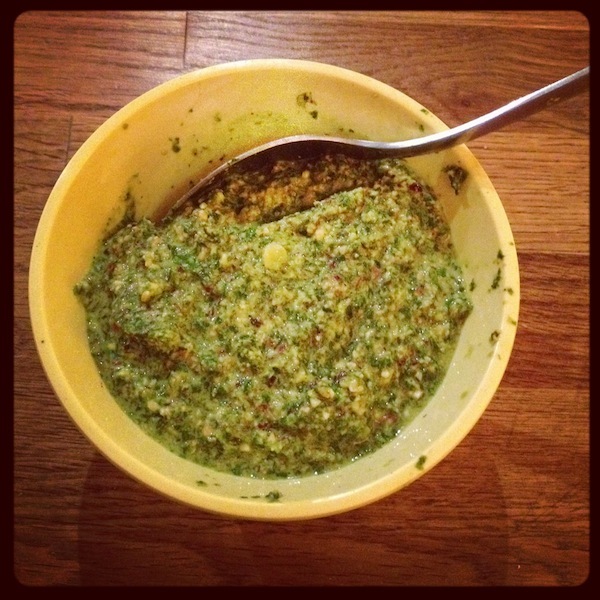 In a food processor process 1 bunch of coriander leaves and 1/2 a bunch of mint leaves with juice of 1 lemon and 1/3 cup shelled pistachios. If you like heat, throw in 1 chopped green chili. Add some water, 1 tablespoon at a time to get the right consistency. Season to taste. Break 3 eggs into a bowl and whisk with a fork. Keep aside. Whisk a tub of sour cream and keep aside. To assemble the wrap, watch the video. The Johnny: an Indian street food wrap from The Oven Experiments on Vimeo. This entry was posted in Experiments and tagged chapati, chutney, coriander, cumin, eggs, food, indian, johnny, mint, street food by Besma at Life Demiraged. Bookmark the permalink. Besma traveled the world then got married and gave birth twice, each time to a boy. She has now decided it was the right time to go public with her writing. Her next goal is to get published. Thanks for the clarification. Although Frankie sounds funkier, egg roll makes much more sense!